In this image of the Apollo 17 landing site, captured by NASA’s Lunar Reconnaissance Orbiter, the trails made by astronauts on foot can be distinguished from the dual tracks left by the lunar roving vehicle (LRV). Also visible are the descent stage of the Challenger lunar module and the LRV, parked to the east. Eugene Cernan may be gone, but he left a lasting mark in the heavens. 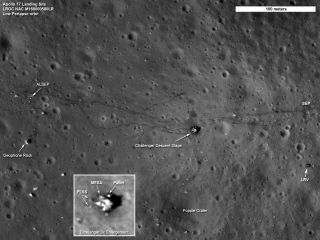 The tracks Cernan — who died Monday (Jan. 16) at age 82 — and Apollo 17 crewmate Harrison Schmitt made on the moon's surface in December 1972 are still visible today, as these images captured by NASA's Lunar Reconnaissance Orbiter (LRO) spacecraft show. The LRO photos reveal both the snaking footprints of Cernan and Schmitt and the tire tracks left in the lunar dirt by the Apollo 17 rover. LRO has also spotted hardware left behind by the mission, including the rover, the Apollo 17 descent stage (known as Challenger), the Apollo Lunar Surface Experiments Package and a transmitting antenna. The car-size LRO probe has snapped similar photos of all six Apollo landing sites, which are spread across a broad swath of the lunar surface. Footprints left on the lunar surface by Apollo 17 astronaut Gene Cernan in December 1972. Most of these astronauts' footprints, and the Apollo hardware, will last a long time — many millions of years, most likely. Erosion by wind and water does not occur on the moon, which harbors no liquid surface water and has just a wispy "exosphere," as opposed to a thick atmosphere like that of Earth. And there are no active lunar volcanoes, so burial by lava is not a concern, either. Particles from the sun hit the lunar surface, but they wear away surface features extremely slowly. So the only real threat to these space-history landmarks in the foreseeable future (aside from human meddling) is a direct hit by meteorites. Such impacts are far more common on the moon than on Earth, whose atmosphere burns up most incoming space rocks. The $504 million LRO mission launched in June 2009. The spacecraft first scouted the moon to help NASA plan for future lunar-exploration missions. Since September 2010, however, LRO has been operating in more of a pure-science mode.